The start of the men’s 50 k freestyle mass start last week at Canadian Ski Nationals in Canmore, Alberta, with Graeme Killick (1) at the front (Photo: W. James MacLean). CANMORE, Alberta — Canadian Nationals went to Canmore for 2017 and Canmore delivered. 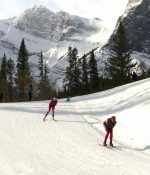 Famous for challenging courses, well-trained volunteers, and erratic weather; the Canmore Nordic Centre showed all three at their best during the eight-day event. Each day delivered warm sun, cold winds, snow flurries, and warm winds (often all occurring in a single race lap) to more than 600 racers. The first races each morning were held on fast, transformed snow that transitioned to slow and soft in the afternoon. While 30 of Canada’s top skiers missed the first two days of racing, with a new relay cross event and freestyle interval starts, while competing at World Cup Finals in Quebec City, the real action was in the younger categories with more than 100 racers in each. 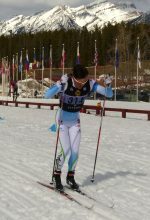 Retired biathlete Zina Kocher and Para-Nordic Ski Team guide Graham Nishikawa collected the open category national titles, while the University of Denver’s Moritz Madlener, a U.S. student from Germany, won the overall. On Tuesday, March 21, most of the World Cup Finals racers arrived in time to compete in the 10/15 k classic interval starts, with Devon Kershaw and Emily Nishikawa recovering to take the open-category gold medals. 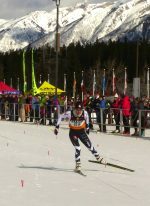 In the men’s A-final, Madlener took the overall victory ahead of his University of Denver teammate Dag Frode Trollebø. Evan Palmer-Charrette placed third overall, and as the top Canadian, he earned the national title. Thursday held classic sprints for the younger categories and Friday was a rest day for the volunteers. 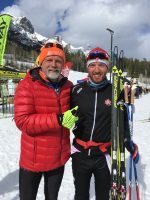 Saturday, March 25, brought the 30/50 k freestyle mass starts, with Emily Nishikawa completing her hat trick and another World Cup Team member Graeme Killick showing off some little-known sprinting talent to win his first 50 k.